Yesterday, a good friend turned 60. 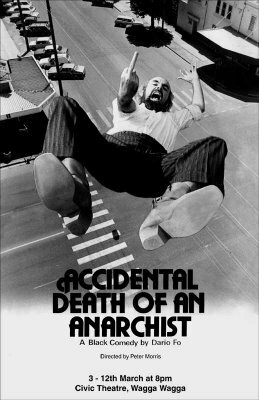 Back in 1983 I directed a production of the political black comedy Accidental Death of an Anarchist and before starting production I had a very vivid image in my mind of what I wanted on the poster - the anarchist (who is not a character in the play) making a last gesture of defiance at the persons who had just pushed him out of a 6th story window. I plastered this all over town and the play was actually a great success.